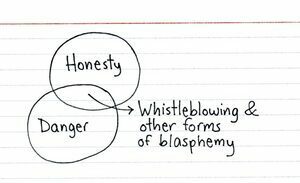 Posted in Misc and tagged comics, Whistleblowers at 9:39 am on May 15, 2017 by Admin. 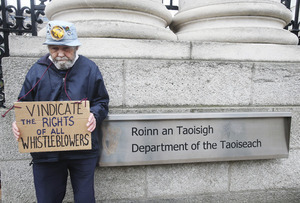 Activist Colm Roddy, a constant presence outside the Department of the Taoiseach, posts his feelings on the treatment of whistleblowers. Posted in Misc and tagged Colm Roddy, Whistleblowers at 2:11 pm on February 14, 2017 by Broadsheet. Yo may recall the two recent protected disclosures sent to the Tanaiste and Minister for Justice Frances Fitzgerald. They were reportedly sent by Sgt Maurice McCabe and Supt Dave Taylor, former head of the Garda Press Office – with Supt Taylor stating he was instrumental in the campaign to discredit Sgt McCabe. Yesterday, Philip Ryan, on Independent.ie, reported on a meeting that took place between the two gardai in which Supt Taylor told Sgt McCabe about the campaign. Taylor said three phones, which are currently in garda custody as part of the investigation into leaks, held the evidence to back up his claims. He said the phones contained chains of text messages outlining the plot to target McCabe by spreading vicious lies about the whistleblower and his family. 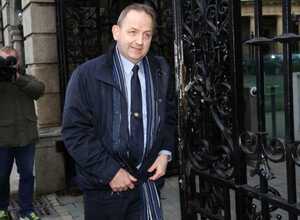 The texts were sent to senior gardai, members of the media, and prominent politicians. The allegations could never be printed due to the defamatory nature of the claims, but they spread like wildfire in political and garda circles. No matter how many times independent investigations proved McCabe’s claims were correct, there was always a cloud over his reputation. Taylor told McCabe he regretted the role he played in spreading the rumours but insisted he was acting under instruction. He claimed former garda commissioner Martin Callinan knew what was going on, as did his successor Noirin O’Sullivan, who was then a deputy commissioner. It was further reported that, in February 2015, Ms O’Sullivan’s husband Det Supt James McGowan seized Supt Taylor’s phone and laptop two months before Supt Taylor was arrested for allegedly leaking information to a journalist in relation to a Roma child being taken into custody over fears she had been kidnapped. On Friday, Minister for Justice Frances Fitzgerald appointed former High Court judge Justice Iarlaith O’Neill to review Sgt McCabe and Supt Taylor’s claims. Further to this, the solicitor of fellow Garda whistleblower Keith Harrison, Trevor Collins spoke to Cathal MacCoille on RTE’s Morning Ireland this morning. It came after Colm Burke, on yesterday’s This Week, reported on a letter Mr Collins sent to Ms Fitzgerald, on behalf of Mr Harrison, following the appointment of Justice O’Neill. 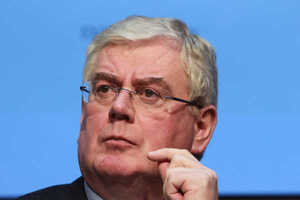 During the Morning Ireland interview, Mr Collins raised concerns about the scope of the new inquiry. 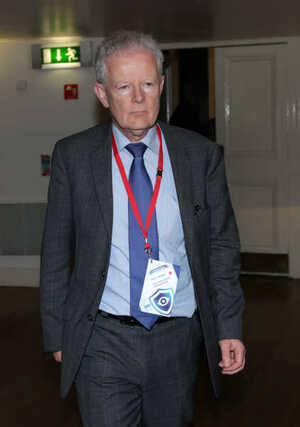 Trevor Collins: “Well my client, two and a half years ago, Cathal, made a disclosure, a protected disclosure to, at that time, the Confidential Recipient which was later referred to GSOC and, following on from that, my client has had to endure a campaign that has been orchestrated, we believe, senior members of An Garda Siochana – the sole purpose of which has been to undermine his credibility and effectively destroy his reputation and this campaign has been endured by my client. We have made known to the minister and Tanaiste that this has been ongoing and that we’ve called upon her to take action. 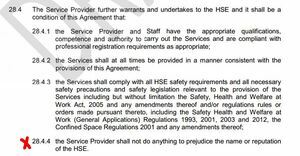 Posted in Misc and tagged An Garda Síochána, Whistleblowers at 2:11 pm on October 10, 2016 by Broadsheet. The European Ombudsman, Emily O’Reilly, has opened an investigation into whether the EU administration is living up to its obligation to introduce internal whistleblowing rules. She has asked nine EU institutions, including the European Commission, Parliament, and Council, to inform her by 31 October 2014 about the rules they have in place, or intend to introduce. 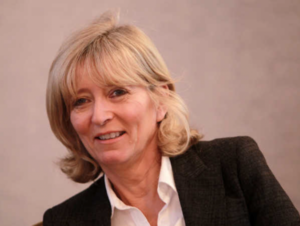 Posted in Misc and tagged Emily O'Reilly, EU Ombudsman, Whistleblowers at 1:14 pm on July 28, 2014 by Broadsheet. Are you neither tarnished nor afraid? There’s never been a better time to blow. The Shell to Sea campaign is making a fresh call for whistleblowers to come forward to expose malpractice and corruption in the facilitation of the Shell Corrib gas project. The call comes in the wake of the publication of the Guerin report and against the backdrop of the ongoing criminalisation of protest against the imposition of the Corrib gas project in Co Mayo. 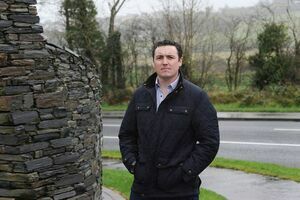 He was speaking after yesterday’s sitting of Belmullet District Court where three Shell to Sea campaigners were appearing on charges arising from a mass protest at the main Shell work site for the construction of the onshore Corrib gas pipeline. 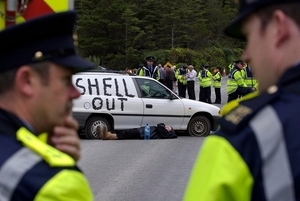 So far, one former Shell subcontractor – OSSL – has already come forward exposing the corrupt delivery of €35,000 of alcohol to Gardaí drafted into Mayo in 2006 to police protests. Corrib whistleblowers may contact the Shell to Sea campaign at mayoshelltosea@gmail.com or by using the feedback button at Shell to Sea. Posted in Misc and tagged appeal, Corrib, Shell To Sea, Whistleblowers at 1:07 pm on May 15, 2014 by Broadsheet. 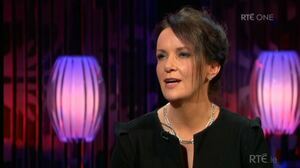 Dr Ciara Kelly, from RTÉ’s Operation Transformation, appeared on The Saturday Night Show last Saturday and spoke to host Brendan O’Connor about Health Minister James Reilly’s free GP care for children under six initiative and specifically about Section 28.4.4 that’s in the draft contract. Dr Kelly: “I promise you, that’s right. Or, people maybe go to the NHS model, one to three weeks is the average waiting time for an appointment GP on the NHS. Currently, what we have in Ireland is a very rare thing – instant access to your GP. And the other thing, I would say, quickly, is that we offer an egalitarian one-tier system, which doesn’t exist in the rest of our health service. It is the only part of the health service that when you ring up, someone doesn’t say to you, ‘Do you have VHI?’ before they give you the appointment. It doesn’t matter to me whether someone has a medical card, or they are paying money, I will see them the same way – I will see a sick patient with a medical card ahead of a well patient who is private. So, I think we throw that away at our peril, that’s a really good thing – it works. Posted in News and tagged Dr Ciara Kenny, RTE, Saturday Night Show, Under 6 contract, Whistleblowers at 7:21 am on April 14, 2014 by Shayna O'Neill. 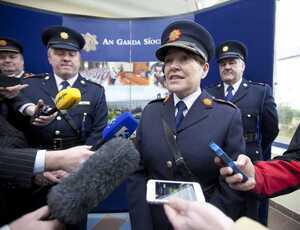 During her speech at the ceremony, Ms O’Sullivan said there needs to be more accepting of internal dissent within An Garda Síochána. Afterwards, she took questions from journalists which involved questions about the fact Garda whistleblower Sgt Maurice McCabe still has no access to PULSE and about reports that Gardaí sought to destroy some of the garda recordings. 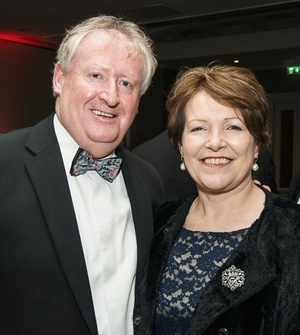 She was first asked if she would have used the word ‘disgusting’ to describe the Garda whistleblowers Sgt Maurice McCabe and former Garda John Wilson – like her predecessor, former Garda Commissioner, Martin Callinan. 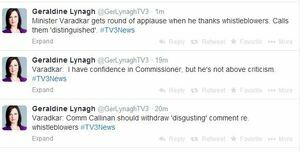 Posted in Misc and tagged Martin Callinan, Noirin O'Sullivan, Whistleblowers at 1:51 pm on April 4, 2014 by Broadsheet. Posted in Misc and tagged Alan Shatter, Eamon Gilmore, Whistleblowers at 12:29 pm on March 24, 2014 by Broadsheet. 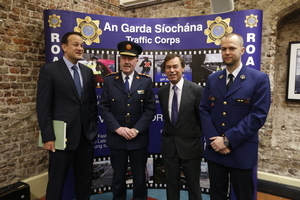 Transport Minister Leo Varadkar, Garda Commissioner Martin Callinan, Minister for Justice Alan Shatter and a European traffic colleague at a road safety event last May. Geraldine Lynagh, of TV3, tweets from a Road Safety Authority conference in Dublin Castle this morning. Posted in Misc and tagged Leo Varadkar, Martin Callinan, Whistleblowers at 11:37 am on March 20, 2014 by Broadsheet.